Today guys we will be talking about a game called Rope Hero published by Naxeex. Rope Hero: Vice Town caters to all devices with some basic options around graphics quality and density of traffic that ensures even the less powerful devices will have a shot at running this action-packed 3D game. To ensure you’re well equipped to enter this fast-paced world you’ll begin with the game tutorial which details the dual stick control scheme (left stick to move and right stick to attack and aim) along with jumping, sprinting and the most important feature the use of your rope. 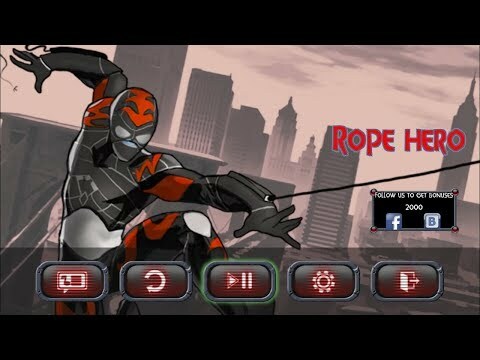 Said rope lets you easily move throughout the city streets and takes clear inspiration from the Spider-Man series of games. Inspiration doesn’t stop there either with the game taking a number of cues from the GTA franchise with the likes of weapons, health, money, and a police alert level also making their way into the core mechanics. Now let`s go into the gameplay of this game and see what she has to offer. It is rare to have such a good action game around. Like most free roam games though this can quickly fall by the waist side and particularly so in Rope Hero: Vice Town as there are incentives to exploration be it experience or money which can be directed to improving your strength. On the experience front, you’ll be able to convert it to tangible benefits such as extra health, health regeneration, stamina, damage and vehicle buffs. Combined with the other mechanics at play such as random gang wars that break out in front of you, a decent range of vehicles to drive (radio included) and the growing potency of weapons as you accumulate money, Rope Hero: Vice Town is one of the top gaming titles in this space. I know that all of you will say ” This is a spiderman game”. Well, you may be right but believe me, this is pretty much like a parody of Spiderman. Don`t be so hard on it. After all, I have said. I think that this game deserves a chance. Just try it!